Bands and brackets are placed on one or more teeth in the upper and lower jaw to correct the position of teeth. 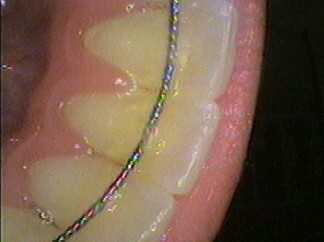 Wires are attached to the bands and elastics are used between the jaws to improve the position of the teeth. The elastics are of various strengths. This appliance is bonded and cemented to the upper (maxillary) teeth by partial banding which exerts a force to widen the maxillary arch and/or teeth. This can allow the jaw to line up better with the lower jaw. This can happen if the upper jaw is narrow. Often, also the palate is high in this situation. A passive device that is bonded to one more or teeth, and is used to prevent the movement of the teeth in relation to each other. This can be used once full bands are removed so to prevent the movement of teeth in an unstable area, often the lower front teeth. Another use is to prevent surrounding teeth from moving into the space created by the early loss of a baby tooth. Often called a space maintainer, it allows the permanent to “erupt” into an uncrowded situation. A procedure using a device that is attached directly to teeth, and provides movement or guidance to correct the position of a tooth. This is often used to “drag” an erupting tooth permanent tooth into the arch, which is coming out at an unusual angle.